Note Teacher : Fun and easy way to learn sight-reading and the names of musical notes. Notes move across the screen on the grand staff. 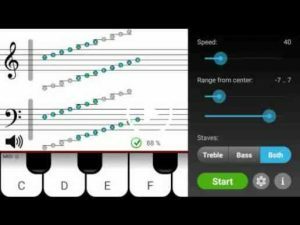 Shoot the notes down by pressing the correct piano key. You can select how fast the notes move and the range of tested notes. Select different key signatures to practice sharps and flats. The application tracks your response times and makes the weak notes appear more often than the ones you can name without hesitation. Practicing with notes on the treble staff is free. The bass staff unlocks with an in-app purchase. If your Android device supports USB MIDI, you can use compatible MIDI devices as input instead of the virtual keyboard. A USB OTG cable is usually required for connecting the devices. Due to manufacturer differences, the MIDI feature may not work on all devices. The best tutor app out of ~10 apps I’ve checked so far. Recognises my midi nicely, really improved my skills. Price is fair for an app of this level. Looking forward to seeing another app on the same technologies from you guys, where I would try playing simple songs. Great application, very useful to practice sight reading. Love it! Would appreciate a timer and some kind of a progress report. Works great with MIDI cable on my Samsung tablet. VERY happy with this app. It allows you to set the range and speed. What more could you ask for when in the early stages of learning to site read. Perfect!